It is Lakshmi Vilas Bank's aim to give its customers the utmost benefit in their banking experience with the introduction of LVB Rewardz. Through this loyalty program, our valued patrons can receive gifts, discounts, offers, and much more. Use your Lakshmi Vilas Bank Debit Card for shopping, dining and paying bills to collect the maximum amount of LVB Points. These LVB Points can be redeemed to get products and services for free or at a lower price. Download LVB Rewardz App and see your statement, redeem your points and do a lot more! Download here. Swipe your Lakshmi Vilas Bank Debit Card at Max Get More partner outlets and accelerate accrual of your reward points. Also get wide variety of exciting redemption options. 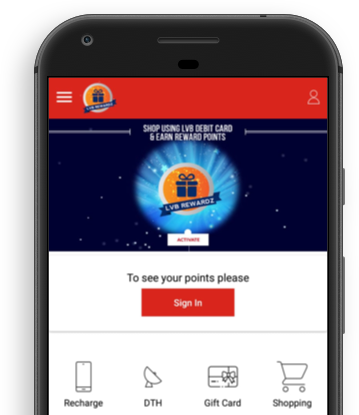 Download the FREE Mobile APP to check and redeem points anywhere.